While there definitely are some interesting games played, I just can't help to notice that they seems to be blurring the line between luck and skill. Many of those games, whose outcomes were heavily dependent on luck, are being presented in a way that the players seemed to be in complete control. Audiences who are not so familiar with the game could easily mistaken that as players' skill, rather than luck are the deciding factors for those games. On top of that, unless there are something supernatural involved, (which I don't believe that's the point this anime is trying to get across), statistically speaking, the game situations in this story are all so extremely unlikely to occur. I believe this story has the potential to attract new people to the game of Mahjong as Hikaru no Go did for Go. But I'm not sure this is the right message we want to send to the new players of the game. At any rate, people who knows the game well would understand how far-fetched all thses plays actually are; but if you're new to the game and interested in learning, enjoy the anime, but, don't take everything in this anime at its face value (except the parts about Mahjong rules :-), too many thing are being misrepresented. DO NOT READ IF YOU HAVE NOT FINISHED UP TO EPISODE 19!!! I think you shouldn't be reluctant to acknowledge the supernatural elements. 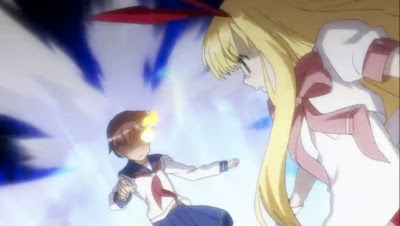 Saki is like other supernatural fighting stories where the main heroine has to battle increasingly powerful supernaturally embued challengers in a series of fights using her own unique supernatural powers. It is hard to deny that the girls are embued with superpowers. For instance, Momoko can make herself and her tiles invisible and inaudible. Certainly, you can say that her powers are metaphoric and that it suits a character who wants to disengage from society and relationships. That may be true, but you cannot discount the fact that she can actually vanish from sight. Now not every girl has supernatural powers, but the show does demonstrate to you which girls have powers and which do not. For instance, we see that Hisa has no supernatural powers and that she is successful by playing with an unorthodox strategy that keeps her opponents off balance. And we see that Kaziki and Kana, who have no powers, have to use all their skills and concentration to manage to play against Koromo and Saki. What was fun about Saki vs Koromo was that it pit two girls with insane supernatural mahjong powers against each other. Koromo, whose powers peak during nights of full moon, can make her opponents oppressively unlucky in picking tiles, make them doubt their own abilites, and lose their spirit and will to play. Saki has the power of great luck, which allows her to pick the exact tile she needs to carry out her plan. And the question at the end of the match was whose power would be greater: Koromo's power to keep the perfect tile out of Saki's hand, or Saki's power to pick up the perfect tile when she needs it?